Smartphones have come full circle. Many years after the likes of Nokia and Motorola continually made mobile phones as small and compact as possible, the likes of Samsung and Sony are now competing on who has the biggest screen. The latest devices continually push the boundaries of what can be declared a smartphone. Two of the newest Android phones that blur the line between a phone and a tablet are the Sony Xperia Z Ultra and the appropriately named Samsung Galaxy Mega 6.3. With 6.4in and 6.3in sized screens, respectively, these devices will immediately become the biggest smartphones on the market. Despite their similar screen sizes, these are two very different smartphones. The Xperia Z Ultra appears to follow a similar design to Sony's Xperia Z smartphone and the Xperia Tablet Z. It's a long rectangle shape with flat sides, square corners and a sheet of tempered glass on both the front and the back. All that extra size means the Xperia Z Ultra weighs a hefty 212g, making it heavier than the Galaxy Mega 6.3. 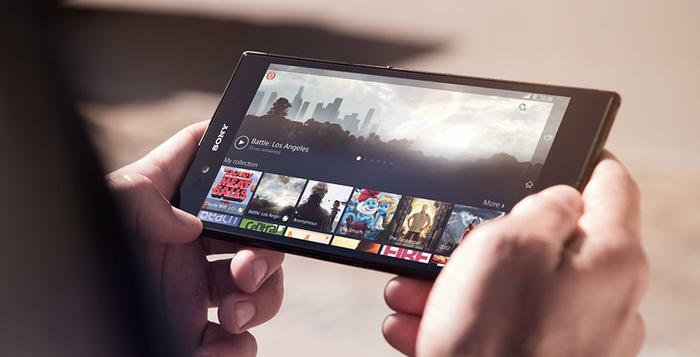 However, Sony says the phone is world's slimmest with a full HD display, measuring just 6.5mm thick. Perhaps the best design feature of the Xperia Z Ultra is the fact that it is waterproof, not just water resistant. The phone will handle water and dust to IP55 and IP58 standards, which is an upgrade over Sony's previous water resistant devices. The waterproof capabilities mean you can even take photos and film full HD videos underwater. 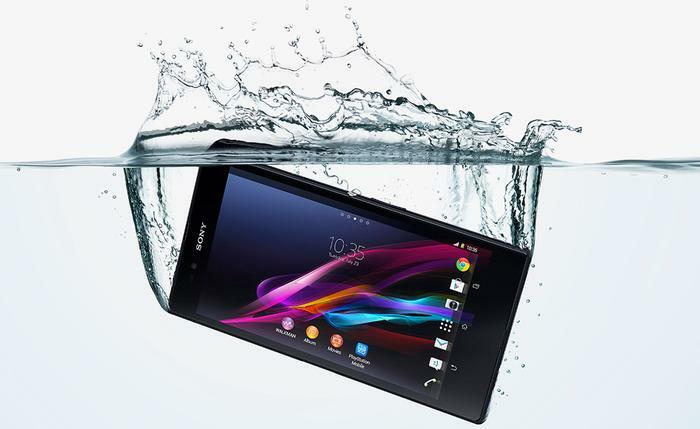 The Xperia Z Ultra is waterproof, not just water resistant. The phone will handle water and dust to IP55 and IP58 standards. The Galaxy Mega 6.3 on the other hand retains a similar look to Samsung's existing Galaxy smartphones, that being the very familiar glossy plastic finish. It's basically an oversized Galaxy S4. It comes in the same two colour variants, uses the same removable plastic cover on the back and also has a microSD card slot. Samsung has been criticised for sticking with a glossy, plastic finish on its latest Android phones, but plastic is more durable than glass and this type of design means the battery is removable. Further, Samsung has sold tens of millions of Galaxy S III and S4 devices, so the look and feel of the Galaxy Mega 6.3 already resonates positively with consumers. Whether you prefer a glass or plastic design is ultimately a personal preference, so our advice would be to try and see these two devices in the flesh before making any decision. The Sony Xperia Z Ultra is a top end phone that is likely to retail for a top end price, so it's specifications are certainly impressive. One highlight is likely to be the 6.4in, full HD "Triluminos" display which is Sony's fancy marketing term for a new technology that claims to display a wider palette of colours. The Sony Xperia Z Ultra has a "Triluminos" display that claims to display a wider palette of colours. The Galaxy Mega 6.3 is a slightly different proposition. It's very much a mid-range smartphone, so we expect it to be priced below flagship handsets like the Xperia Z Ultra. It has a lower, 720p screen resolution (1280x720) resulting in a lesser pixel density (233ppi vs 344ppi) when compared to Sony's model. However, while the screen is less impressive on paper, it's still vibrant and most users won't be significantly disadvantaged. For most uses, the Galaxy Mega 6.3's screen is good enough (and certainly big enough). Both of these smartphones have similar major features. The main aspect you'll need to factor into your purchasing decision is the software overlay that sits on top of Google's Android platform. The Xperia Z Ultra uses Sony's Xperia UI, while the Galaxy Mega 6.3 uses Samsung's TouchWiz overlay. These software overlays are very different. Samsung has skinned almost every part of the standard Android layout on the Galaxy Mega 6.3 with lots of small and possibly useful features, while the Xperia Z Ultra uses a cleaner UI that looks more like Google's stock Android interface. Samsung has skinned almost every part of the standard Android layout on the Galaxy Mega 6.3. Sony's UI allows you to use any pen or pencil as a stylus, provided the tip diameter is over 1mm. The Battery Stamina mode feature seen on the Xperia Z is also present here. It prevents applications from running when the screen is locked, therefore saving power. The Galaxy Mega 6.3 includes many features seen in other Galaxy models including 'Air View', which enables users to hover their finger over the screen to preview selected information on the phone, such as a video thumbnail, a calendar entry, or a photo gallery, an S Translator app that can translate nine different languages using both text to speech and speech to text, and 'Group Play' which can send music photos and documents to multiple devices on the same Wi-Fi network. The Sony Xperia Z Ultra has an 8-megapixel rear-facing camera and a front-facing 2-megapixel camera for video calls. It's got all the usual bells and whistles but optical image stabilisation and HDR for both still photos and video recording are two excellent features and will be great selling points for anyone hellbent on regularly using the camera. The Galaxy Mega 6.3 lacks HDR video and optical image stabilisation, but it has a number of exclusive software features. The Galaxy Mega 6.3 also has an 8-megapixel rear-facing camera with HDR, but there's no optical image stabilisation for still photos or videos. You also don't get HDR video. The 1.9-megapixel front-facing camera handles both selfies and video calls. While the Galaxy Mega 6.3 might lack HDR video and optical image stabilisation, it has a number of camera software features that you won't find on the Xperia Z Ultra. 'Drama Shot' takes 100 shots in four seconds, "Sound & Shot' takes a picture and captures up to nine seconds of audio, and 'Story Album' which groups photos together somewhat like a timeline. These are all part of Samsung's TouchWiz software. Both of these handsets boast reasonably impressive specifications, though the Xperia Z Ultra pushes ahead due to its flagship position. It's powered by a 2.2GHz, quad-core Snapdragon 800 processor and has 2GB of RAM. The 16GB of internal memory is expandable by a microSD card slot and there's also a non-removable 3050mAh battery. The Samsung Galaxy Mega 6.3 on the other hand is powered by a 1.7Ghz, dual-core Snapdragon 400 processor, has 1.5GB of RAM and comes with either 8GB or 16GB of internal memory. A microSD card slot will allow users to expand that storage and the Galaxy Mega 6.3's 3200mAh battery is removable. Both phones will work on all Australian 4G networks. You can use any pen or pencil as a stylus on the Xperia Z, provided the tip diameter is over 1mm. The Xperia Z Ultra will be available in black, white, and purple colour variants. Sony says the phone will launch globally from Q3 2013, but the company has already confirmed the device will officially be released in Australia later this year. The Samsung Galaxy Mega 6.3 is initially slated for release in Europe and Russia but there's been no word as yet if and when it will be released in Australia. What do you think about the Sony Xperia Z Ultra and the Samsung Galaxy Mega 6.3? Which of these giant smartphones would you buy and why? Let us know your thoughts in the comments below!